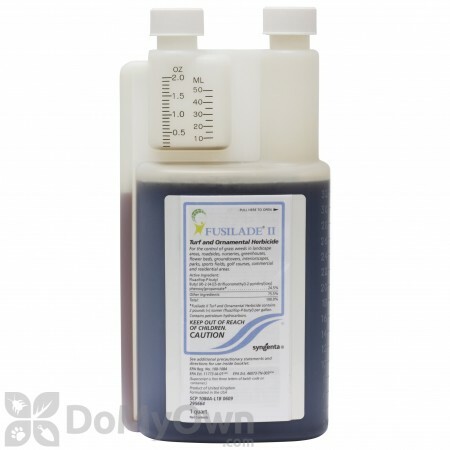 Fusilade II Turf and Ornamental herbicide is a selective post-emergent herbicide that controls a long list of perennial and annual grass weeds in turf and landscaped areas. Not only is Fusilade II fast and effective, but it can be applied as a spot treatment or an over the top application without damaging ornamental plants. It can also be used to remove bermuda grass from tall fescue and zoysia grass when used at reduced rates. Fusilade II can stand up to rain after only 1 hour of application. It is recommended that a non-ionic surfactant be used when applying Fusilade II. 0.4 - 0.6 per 1,000 sq. ft.
Fusilade II works fast, moving quickly into the shoots, roots, rhizomes, stolons and growing points of the treated plants. Weed growth is soon arrested, and within just one week there will be loss of vigor, yellow and/or reddening, and eventual death of the treated grass weeds. I use Fusilade II to kill the bermuda and crab grass growing in a large bed in which I'm trying to get Periwinkle (vinca minor) to take over as the predominant ground cover. I mixed the Fusilade with a spreader/sticker/penetrant called Cadence made by KALO, Inc. I oversprayed the Periwinkle and grass with the mix and (you have to be patient) after about 5 to 7 days the grass was dead and gone and the Periwinkle was untouched. After early research on Fusilade in the 80s with UCCE in CA for crop use, I (aswell as my friends) now find it useful in my flower garden for selective control of annoying annual and perennial grass in Seattle's wonderful gardening climate. But it doesn't control annual bluegrass or fescues. It has some odor so wear plastic gloves. It takes more than a week to get control, but rest after that week. Prompt shipping by this online company. I recently received Fusilade and have tried it in spot areas to se if it effects the flowers planted in the same areas. So far it is working well. It was recommended by our County Extension Agent. I mixed the Fusilade w/surfactant per the label instructions and applied it to my lawn 8 days ago with a garden sprayer. Already the Bermuda grass has yellowed and looks dead. I will reapply in 20 more days just to make sure and then reseed in 14 days. The fescue seems to have survived quite well. After first application mixed with Ester, the Bermuda has taken a hit. The second application a month later is coming up. Is Fusilade II safe to spray on Liriope or will it kill the Liriope as well? Liriope is listed on the Fusilade II label as an ornamental that it can be applied over and it should not kill the Liriope. I want kill Bermuda in el toro zoysia. Am I to apply more than once, and how long between applications? The directions look to be a mix of 2.5 oz to 3.0 oz per acre and add a surfactant, but not sure of amount. Also, it is suggested to apply about June 1st. I live in Bakersfield, CA. Am I to apply more than once, and how long between applications? Fusilade II Herbicide can be used to remove Bermuda grass from zoysia grass when used at reduced rates. Applications should be made around June 1st per the product label. Apply 0.07-0.14 oz/1000 sq. ft. (3-6 oz./A) along with 0.25% v/v (1/2 pt./25 gals.) of a nonionic surfactant. Application should be made every 28 days when the grass weeds are actively growing. Keep in mind for herbicides the amount of water is not important. What is important is getting the correct amount of product, over the correct amount of area. Mark off 1000 sq/ft and fill your sprayer tank with only water. Spray as if you were covering the area with the herbicide. However many gallons it takes you to cover that area is how many gallons to mix the product with. Everyone's walking speed and how heavily they spray is different, which is why whether you use 2 gallons or 8 gallons of water to cover 1000 sq/ft, you are correct. When is the best time to apply Fusilade II to a fine fescue lawn to get rid of Bermuda grass? We have three or four spots of Bermuda grass in our lawn and we would like to eliminate them, or at least minimize them as much as possible. 1. When is the best time/times to apply Fusilade II? 2. What is the best concentration to apply for this purpose to minimize damage to the fescue, which we want? Thanks very much! Apply 0.07-0.14 oz/1000 sq. ft. (3-6 oz./A) along with 0.25% v/v (1/2 pt./25 gals.) of a nonionic surfactant. Application should be made every 28 days when the grass weeds are actively growing. The higher rates may result in temporary discolorization of the desirable turf with recovery in 10-14 days. Do not apply to desirable turf which is under stress. For best results, make applications in spring and fall and avoid treatments during July and August. Complete control of undesirable grass may take 1-2 growing seasons. We also recommend calling your local county extension office as they usually know the optimum times for spraying lawns in your area. How many oz. of Fusilade per gallon of water? Apply 0.07-0.14 oz/1000 sq. ft. (3-6 oz./A) along with 0.25% v/v (1/2 pt./25 gals.) of a nonionic surfactant. Application should be made every 28 days when the grass weeds are actively growing. The higher rates may result in temporary discoloration of the desirable turf with recovery in 10-14 days. Do not apply to desirable turf which is under stress. For best results, make applications in spring and fall and avoid treatments during July and August. Will Over The Top kill torpedo grass without killing shrubs? Over the top is not labeled for torpedo grass. Torpedo grass is an invasive grass species that is very difficult to get rid of. However, we do sell a professional version of over the top called Fusilade II which is labeled for torpedo grass and is what we recommend. It is meant for the same purpose and that is for killing grasses out of your landscaped beds. Please read the product label to make sure it is labeled for use around the type of shrubs that you have.